As the general lighthouse authority for England and Wales, Trinity House fulfils a wide range of responsibilities including the provision of aids to navigation, training of mariners, commercial vessel and navigation services, venue hire, holiday locations and cruises, lighthouse visitor centres and preservation of the organisations 500 year heritage. 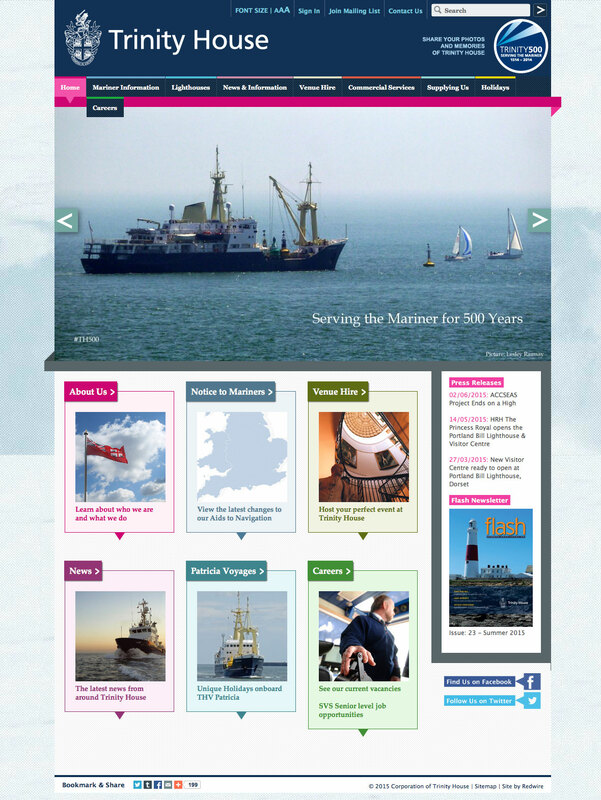 We have been delivering website services to Trinity House for over ten years during which time we have designed and developed numerous websites. We have provided consultation services to help structure the content and hierarchy for the main website ensuring a smooth and intuitive user experience with the highest levels of accessibility. Bespoke development projects have included automated email alerts, a full recruitment management system, a vessel voyage log submission system, forums, wikis and an interactive lighthouse map.